Ammolite is a gem that comes from the fossilized shell of an extinct, squid-like creature called an ammonite. Found in Canada, the iridescent shell of fossilized ammonites is available as ammonite fossils or in iridescent gems cut from the fossils under the trade name ammolite. 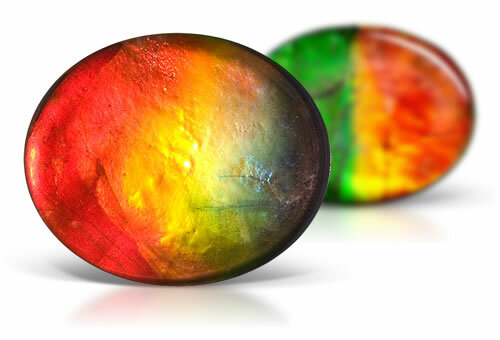 Ammolite's iridescent play of color is what makes it so distinctive and attractive. Its iridescence occurs when the fossilized ammonite shell becomes mineralized. Unlike most gems, whose colors come from light absorption, ammolite's iridescent color is caused by interference with the light that gets trapped within stacked layers of thin platelets that make up the fossilized shell. Since the layer of ammolite is typically thin, most ammolite is made into doublets or triplets for use in jewelry. A doublet is a thin slice of shell that is typically covered by a durable material (often crystal, glass or plastic) that both protect the gem and maximize its presentation. Triplets are typically assembled by placing a thin slice of shell between two layers of more durable material that are attached with epoxy. While shades of green and red are usually seen, all spectral colors are possible. Fossilized shell of nautilus like creature. Ammolite or calcentine material is from Alberta, Canada. Ammolite or ammonite can be iridescent with mosaic patterns. Due to the nature of the material it is often stabilized with polymers. Well preserved specimens show a nautilus or spiral like appearance. Ammolite is often made into doublets or triplets. Quartz or lab created spinel is used as a dome and the base is typically made of shale, glass or lab created spinel.